La Sportiva’s story and it would be with him that I would be working. I remember perfectly my first encounter with Lorenzo, we had crossed paths at Bardonecchia at the Sportroccia in 1985. He was pulling out the sought after yellow t-shirts with the purple writing from a big bag handing them out to the athletes, I would have loved to have had one as well but they were specially reserved only for the members of the climbing team. The best climbers wore them. Over time at ISPO and other trade fairs and during the RockMaster Lorenzo and I would cross paths many times, without ever introducing ourselves. 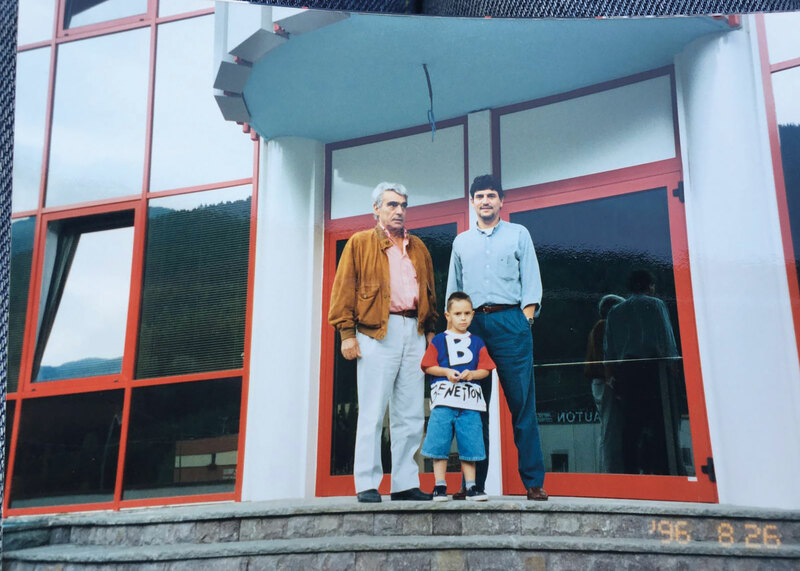 What struck me about Lorenzo was the relationship he had with his father, Francesco, who in turn I had learned to recognise during our casual encounters, their being together and always moving around as a partnership surprised me and intrigued me. Now I was there, inside his company to help him narrate his story and I found myself dealing with the part of his family tree which was unknown to me. The first thing I discovered about Lorenzo’s son when we introduced ourselves and shook hands, was his name: Francesco, the same as his grandfather. I also have the same name as my grandfather, it used to be common to do so. Francesco proved to be on the ball straight away, enthusiastic and available, he had already done a huge job of collecting and cataloguing the material and gathering testimonies, the documents and the photographs. All in a room which then became our work area, a sort of base camp from where to start off and come back to after each research. In the ‘museum room’ with him we interviewed, laid out work plans, making rough drafts of sections, and imagined topics for this book. This project’s true challenge was to try and understand what parts to tell of this long story which lasts ninety years, because it was evident that you couldn’t tell all of it from beginning to end. Not all the episodes, not all the people, not all the events and interviews could be told, obviously. We continued for months to interview people, to listen to them and to read, to combine memories and cross-reference information. Francesco was always responsive and available, careful to always put me in the best conditions to meet one person or another and the same must be said about anyone from the company or collaborators whom we called, interviewed, sometimes even took away from their tasks to tell us their stories. To all these people go my most heartfelt thanks. Accuracy, this is the word that best summarizes more than any other the work and attitude of Francesco. He is a silent worker, stubborn and full of passion. At one point - I remember the exact moment when this happened - I realised that this book’s true theme was work. Francesco and I were interviewing Giuliano Jellici and as he spoke about the birth of the Miura climbing shoes he told us that sometimes at work you are not always the one who finds the solutions, but it is the solutions which find you. You only have to work hard and insist and then the result sooner or later arrives. Worried about choosing which stories to include in this book, I thought that probably we would have to be inspired by the same principle. Insist in collecting and listening, work hard. Then the stories we had to recount, the thread of narration would reveal itself on its own. If this company has become what it is, in ninety years of history, it is thanks to this immense and unshakeable trust in one’s work. At La Sportiva - this is what I think I have understood about this company and the family which manages it - nobody thinks that a collaborator will pull a rabbit out of a hat. They don’t expect magic. They expect hard work, devotion, passion. Work. This company’s success is based on perseverance and methodology, on believing and on trusting, it is something that is so deeply rooted that I believe that the word has something to do with faith. In innovation. In work, in the people, in the ideas, in the relationships. In what is possible. And it is by doing everything that is possible, to the maximum of one’s abilities and by persevering, insisting without asking too many questions that sometimes the impossible is obtained. This is what they do at Ziano di Fiemme, at least this is what I believe I have understood. 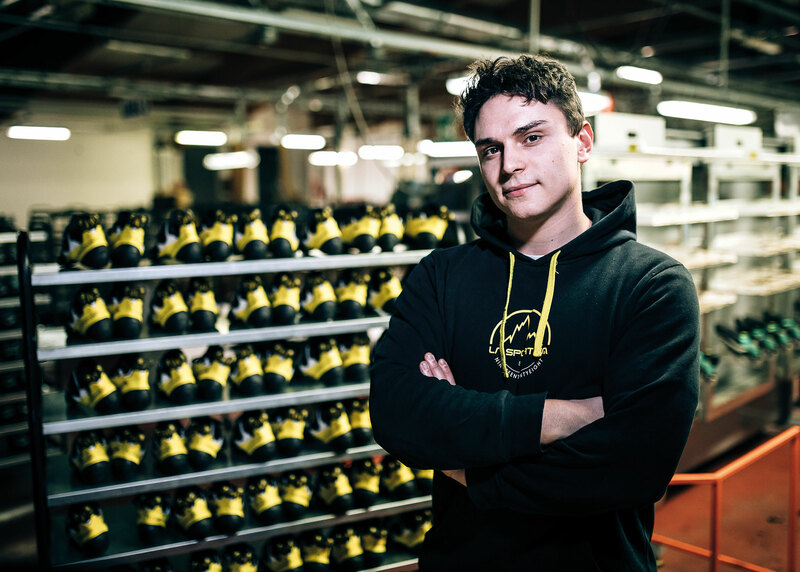 Francesco is the youngest descendent of the Delladio family and he works with the same idea and the same attitude as his sister Giulia, his father Lorenzo, his grandfather Francesco and his great-grandfather Narciso and with the same philosophy as all those who with their work have made La Sportiva the successful company it is today. To spend these past months here, working on this project has been a pleasure and a unique privilege.